Prof. Phillip Clampitt of the Information and Computing Science faculty has been honored at the University of Wisconsin-Green Bay with his selection to hold the University’s prestigious John P. Blair Endowed Chair in Communication. 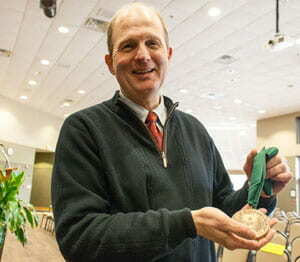 Clampitt was presented a medallion signifying the honor Wednesday (Jan. 23) during UW-Green Bay’s mid-year convocation to open the second semester. The award was made by Chancellor Tom Harden and Provost Julia Wallace. Clampitt, a nationally regarded researcher and writer on strategic and organizational communication and leadership, has been a member of the UW-Green Bay faculty since 1981. He succeeds retired colleague Timothy Meyer as “Blair Chair” professor, a position Meyer held since the professorship’s inception in 2005. Clampitt teaches in both the Information and Computing Science and the Communication academic units at UW-Green Bay. He received his doctorate in organizational communication from the University of Kansas. He has been published in leading management and communication journals. The Wall Street Journal and MIT Sloan Management Review highlighted his work on “Decision Downloading” which details how companies can effectively communicate decisions to employees and stakeholders. His most recent book, Transforming Leaders into Progress Makers: Leadership for the 21st Century, co-authored with Boldt Company CEO Robert J. DeKoch, won critical praise. It combined original research with first-person stories of successful leaders, and offered strategy suggestions for progress-making leadership. Clampitt is also the author of the textbooks Communicating for Managerial Effectiveness, fifth edition; and Embracing Uncertainty: The Essence of Leadership. Clampitt founded the consulting firm MetaComm and has completed communication audits and applied research projects with major employers throughout Wisconsin and beyond. In addition to many guest speaking opportunities in the United States, he has also been invited to speak internationally at The University of Pisa, The University of Aberdeen, The University of Ulster, and before numerous multi-national businesses and professional organizations. Clampitt most recently held the title of Philip and Elizabeth Hendrickson Professor of Business at UW-Green Bay. He is a recipient of the University’s Founders Award for Excellence in Scholarship. An endowed chair permanently adds a full faculty position in a focused area of importance to the donor and to the University. The chair is filled by a distinguished faculty member who has a national or international reputation in his or her field. Since the Blair Chair became UW-Green Bay’s first endowed professorship in 2005, the University has been able to expand its communication offerings. Meyer, the original holder, says the Blair gift allowed his unit to expand the curriculum and offer more and advanced courses in public relations and, specifically, media planning and buying. The John P. Blair Endowed Chair in Communication honors the memory of one of America’s early pioneers in the field of radio and TV advertising. In 1948, after greatly expanding his radio station sales-representative business, Midwest native and New York City ad executive John Blair established the first agency of its kind devoted to selling spot television advertising. Years later, his widow, Dorothy, would make the multi-million dollar gift to establish the chair. In doing so, she expressed her family’s respect for the University of Wisconsin, the quality of UW-Green Bay’s undergraduate programs in communication, and the region’s strength as a communication and media market. This entry was posted in Headlines, News Releases and tagged achievements, convocation, endowed chair in communication, faculty, Information and Computing Science on January 23, 2013 by Christopher Sampson.